Increasingly, British workers are recognising that the EU is damaging their interests, blocking any possible gains for workers and their trade unions in any EU state. So it is timely that this highly readable and well researched analysis is now available, providing extensive and rigorous evidence. It is essential reading that undoubtedly will assist in the process of moving workers from dissatisfaction to outright, conscious opposition, demanding withdrawal from the EU. The book's historical sweep is apparent from the opening chapter, which outlines succinctly all major developments between 1950 and 1992. It describes the inception of the European common market. It notes that in the beginning the British political estab-lishment had no wish to join this union: the governments of Churchill, Eden and Macmillan were against participating in European integration. 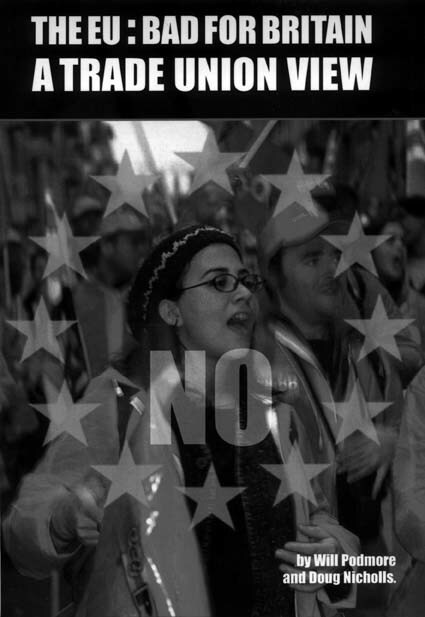 In the 1950s and early 1960s, the opinion of government and people was hostile to a supranational authority that would have the right to close down our pits or steel works and interfere in our economic life. It points out that initially the EU's founding strategy was to deal with economic targets, leaving the attainment of political targets till later. The aim was a steady leaching away of sovereignty in the basic economic arena. Meanwhile behind the scenes they carefully prepared for political union. At a certain point, when all the countries had been lured into the bag of economic union, they would tighten the drawstrings and declare full political union. Thus the European Coal and Steel Community in 1951 paved the way for the Treaty of Rome in 1957, which established the EEC. By the 1960s, however, attitudes in the political establishment started to change, as Britain's economic prospects darkened and its relative powers declined. In addition, the US government put increasing pressure on Britain to join Europe. Though De Gaulle's France vetoed Britain's entry during the 1960s, in 1973 Heath signed Britain into the EEC. In 1975 Wilson's Labour Government with a mix of lies and false promises managed to win a referendum on remaining in the EEC. Later Thatcher was to endorse the Maastricht Treaty and one of her last acts was to join the disastrous ERM (Exchange Rate Mechanism). The authors then report comprehensively on the drive to a single EU state in the years since 1992. If you are interested in discovering what kind of creature the EU state is, then there is a mine of information outlining the undemocratic workings of the EU and its institutions. The EU functions like a giant corporation, its unelected quangos make the laws, the EU takes away not only our national sovereignty and independence, but also our democracy. The European Commission, the apex of everything in the EU, is an appointed not an elected body. The book informs us not only how the Commission operates but also the EU President, the Council of Ministers, the European Council, the European Parliament, the European Court of Justice. A thorough examination follows of the endemic corruption within the EU. There is a valuable section on the political and economic costs of EMU (Economic Monetary Union) and its effect of increasing flexibility in the labour market and worsening growth and unemployment. Another section of the book provides a cautionary tale describing the adverse effect on the British economy and British industry of the EU with additional segments outlining the damaging effects on our agriculture, fisheries and public services. The authors conclude with a rousing message of Yes to independence and sovereignty, and Out of the EU. These two examples from the thought-provoking conclusion are an indication of the quantity and quality of ideas expressed within it. Asserting sovereignty is the root of wisdom for a country, just as joining a trade union is for workers. For each it is the birth of dignity; for neither is it an end in itself. What matters is what you do with it. We have been careless of our inheritance so now both trade unionism and British sovereignty are under attack. To assert and fight for the sovereignty of Britain should be as natural to workers as joining a trade union. Both have the same aim: to keep our freedom. Asserting our right to decide what happens in Britain parallels asserting the right to have a say in our wages and conditions of work. Nobody has a right to interfere in Britain's affairs, any more than we have a right to interfere in any other country's affairs. National sovereignty is vital. No country run from outside ever amounted to anything. Sovereignty has been one of the great dynamics of human development – if a country does not run its own affairs, those who control it prioritise their own interests, at the expense of the controlled country's interests. Buy this book and your understanding of the dangers posed to our class and country by the EU will be multiplied a thousand fold. The EU: Bad for Britain, by Will Podmore and Doug Nicholls, £8 (ISBN 0-9542112-5-1), is published by Bread Books, PO Box 1806, Coventry CV6 1YJ.